Head south on US-10 E and turn Left onto MN-115 E. Travel east on MN-115 for approximately 4.5 miles, and turn Right onto Forest Road; 37 Acres RV and Campground entrance is on the Left. Take MN-371 S to the County Hwy 47 Exit toward Randall/ MN 115. Turn Right on to MN-115 W and travel west for approximately 4.25 miles (passing the Main Gate of Camp Ripley). Turn Left onto Forest Road; 37 Acres RV and Campground entrance is on the Left. Take I-94 W toward St. Cloud and continue to Exit 193 for MN-25 toward Buffalo/Monticello. Turn Right on to MN-25 N and travel for approximately .8 miles. Turn Left onto Park Blvd SE, which turns into 165th Ave SE, and travel for approximately 3 miles. Turn Left onto US-10 W. Travel north for 54 miles and take a slight right onto MN-371 N. Continue for 5.3 miles north and take the County Rd 47/ MN-115 Exit toward Randall. 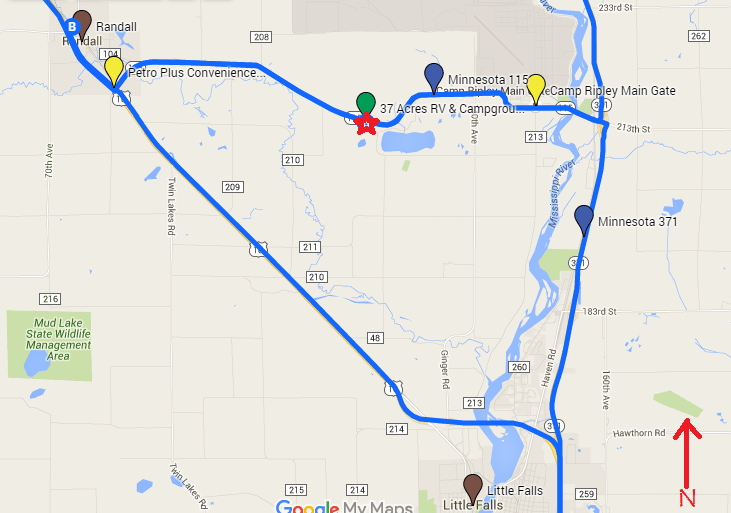 Turn Left onto MN-115 and travel west for 4.37 miles (passing the Main Gate of Camp Ripley). Turn Left onto Forest Road; 37 Acres RV and Campground entrance is on the Left.